We’re not sure we have the words to describe how we feel after watching this video. The president of the Philippines, Rodrigo Duterte, has just ordered about £4.2 million worth of luxury and sports cars to be destroyed. This is the footage. Apparently he rather dislikes expensive cars being smuggled into his country in an attempt to dodge the nation’s extremely painful tax regime. It has become a symbol of the corruption he is trying to fight, and he sure as hell makes a statement out of his response. Any model worth over £57500 in the UK – using the exchange rates as we write this – is slapped with a nasty 50 per cent tax bill on the value of the car. Electric cars are exempt, while hybrids only pay 50 per cent of the usual tax rate. This doesn’t just create a society that actively discourages ownership of nice internal combustion-fuelled cars; it also drives up illegal imports. The government’s rebuttal is to drive an array of construction equipment over them while the CT office falls silent apart from the soft thuds of tears hitting desks. The latest batch of 68 cars could have been sold to overseas buyers; the proceeds helping to boost the parliamentary coffers and keeping the cars on the road in the process. Some are rare, some are classics, and some are so special that it should be a crime to even lay a finger on them in anger. Strangely, though, the models in this footage are all old. There’s not a new car in sight. If any CTzens can explain the anomaly, let us know. 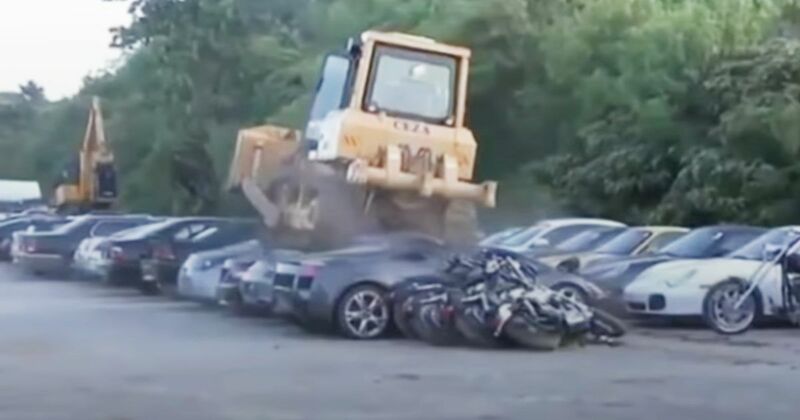 Try not to cry as you watch the likes of a Lamborghini Gallardo, many Porsche 911s, several old Mercedes and more get crushed into scrap. Apparently, Duterte has also crushed a BMW Z1 before now. We feel like he might not make our Christmas card list.